2017 Cave Yves Cuilleron, Syrah “Les Vignes d’à Côté” Vin de France, Northern Rhone, France. One of the Northern Rhone’s top guns, Yves Cuilleron is making some of the best wine of his career, with the last three vintages all being outstanding, so it was really cool to get an early sample of his 2017 Syrah, which is gloriously pure and delicious, to see what this vintage will look like in comparison, and while his 2015 and 2016 were absolutely awesome, this 2017 looks just as good f not better! Cave Yves Cuilleron, once known as just the Family Cuilleron was founded back in 1920, and Yves’ grandfather was the first in the region to actually bottle wine commercially for sales, prior it was almost all sold in bulk or casks, back in 1947, Yves himself assumed full ownership and direction of the domaine in 1987, taking over from his uncle, and since that time has built an entirely new facility in the area of Chavanay. 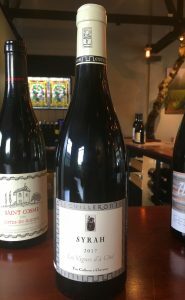 While most known for his Condrieu and Cote-Rotie he also makes a stellar collection of Saint-Joseph, Cornas and Crozes-Hermitage as well as a line of varietal wines including this 100% Syrah from granite and alluvial soils near his village, Chavanay, near the border with the Crozes zone, in the Collines Rhodaniennes, in a steep parcel of vines. The Les Vignes d’a Cote is a special cuvee that saw all de-stemmed grapes, it was fermented in cuve and aged in a combination of stainless and small neutral barriques to allow for expressive detail and freshness, it’s a great starter wine to get to know the Northern Rhone and is always an outstanding value. This 2017 Les Vignes d’a Cote is striking and with exceptional varietal character, showing a deep purple/garnet color in the glass and with a beautiful perfume of crushed violets, primary black and blue fruits, spices and camphor notes that not only come through on the nose, but transfer to the palate as well, there is ripe blueberry, plum and black cherry fruits as well as subtle creme de cassis, black olive, fresh ground peppercorns, faint cedar and anise. The mouth feel is richer and more substantial than you’d expect from this bottling, highlighting what looks like a great vintage in the making, and the Cuilleron elegance and finesse is on full display, this is a case worthy, if not more, wine to enjoy over the next couple of years while you cellar your Cote-Rorie, Saint-Joseph and or Crozes-Hermitage!